On the island of Barbados in the Caribbean sits the picturesque Christ Church Parish. It's just like a lot of churches all over the world complete with a quiet graveyard where many of the island's inhabitants end up for their final rest. However, in one tomb in this cemetery, the dead are anything but at rest. It's called The Chase Vault and it is at the center of one of the island of Barbados' most chilling and sinister mysteries. I heard this story some time ago, and the theory was that the tomb was filling with water in winter moving things around, then they open it in summer and all the water is gone leaving the coffins all over the place, leaving no foot print of humans. I'm not sure if this is the case, but it makes sense. Edited by lorac61469, 28 March 2017 - 04:26 AM. Well not so fast with water theory. The grave attendees put sand in the their. Also one coffin got chipped due to the violent relocation. The violent relocation happened more than once. One coffin dissappeared and re appeared after a number of yrs. If water or flood was the culprit why wouldn't other crypts be affected. However there is no actual evidence anyone was ever buried there. Then there is an almost identical story from Estonia. The only difference is the year and that wood ash was spread not sand. 1815 related the case of "The Curious Vault at Stanton in Suffolk"
...."Another moving-coffins story, however, could not have been based on the Barbados incident because it saw print before the West Indian events became known. The European Magazine for September 1815 related the case of "The Curious Vault at Stanton in Suffolk" in which coffins were "displaced" several times under mysterious circumstances. Nathan Lucas, one of the alleged witnesses to the final (1820) interment at the Chase Vault, mentions this English case, even quoting the article, in his privately written 1824 account. A final tale is told by F. A. Paley in Notes and Queries, November 9, 1867, of an "instance which occurred within my own knowledge and recollection (some twenty years ago) in the parish of Gretford, near Stamford [England], of which my father was the rector. Twice, if not thrice, the coffins in a vault were found on re-opening it to have been disarranged. The matter excited some interest in the village at the time, and, of course, was a fertile theme for popular superstition: but I think it was hushed up out of respect to the family to whom the vault belonged." Paley quoted from an unnamed woman who claimed to remember the incident. " European Magazine for September, 1815, under the heading. "The Curious Vault at Stanton, in Suffolk." The PDF provides some interesting info about the mysterious moving coffins esp the Vault at Stanton. I've been able to find four other stories different than the one's above. I'll share if and when i find more than one source. Seems to me if one is to believe the coffins moved by supernatural means, one must dismiss beyond a reasonable doubt all other explanations. For example, did the crypt flood numerous times? Are we sure no one else broke into the crypt as a grave robber or to fake the moving? How reliable are the original accounts? Thanks for your input Lamfada and agree, something that should be considered! Mentioned in the story but not often talked about is the door that guards these tombs (coffins) and the coffin themselves. The removal of the door requires five men or more. As does the moving of the coffins. The phenomena has happened multiple times over several years. Once instance a coffin disappeared. The family during a ( funeral reception ) noticed the missing coffin as they were burying another family member. They also noticed all the other coffins had been moved. I'm not talking about a few inches. I'm talking several feet. Some coffins even made they were unto the inner steps of the crypt, near the door. The tomb was resealed with the new deceased family member. The next time the tomb was opened to bury someone else the missing coffin had returned. The coffins had been moved around again. Those present describe this tomb as having a dirt or sand surface. There were no foot prints, no sign of a human intruder. This went on for several years. Which is very odd for someone playing a hoax. Then you got the earthquake and water theory. An earthquake doesn't explain the missing coffin. Nor does it explain why other tombs and coffins were effected, nor does it explain multiple events happening over several years. Then there's the water theory. Same thing. Doesn't explain the missing coffin, zero water sediment. No other tomb within the cemetery experienced anything remotely similar. It should be noted that there is a phenomena linked to Poltergeist that involves the sounds of moving furniture being dragged around. It's real I've heard it. The sound resembles heavy objects being dragged around on a wooden surface, very labor intensive. What makes this phenomena weird is its been reported throughout the ages - documented on every continent just about. What's even weirder is the sound does not lend itself to the environment where its being heard. Where is this noise coming from? Is it a portal? Its an open door? Is it another dimension? Other unexplained phenomena speak to crashing sounds. Phantom Piano crazing sounds. I've heard this too, in my own house. I don't own a piano, let alone have one that would sound as if it was coming through to the ceiling. I believe the noises I've heard. The noise being reported by others that are identical or eerily similar are noises of large objects being moved far far far away. That coffin that disappeared had to go somewhere. Some of the skeletal remains fell out of their coffins due to the move. Fascinating write up, MacQdor... thanks for giving us your knowledge about all of this. "According to author Jerome Clark, the story of the Chase Vault appears to originate from anecdotes told by Thomas H. Orderson, Rector of Christ Church during the 1800s. Orderson gave "conflicting accounts" of the tale, each containing variations. Clark says the story was subsequently repeated in Alexander's 1833 Transatlantic Sketches, and further repeated the same year in the "Anecdote Gallery" section of Reuben Percy's The Mirror of Literature, Amusement, and Instruction. Clark says that most stories that proliferated about the Chase Vault referred back to sources that could be traced to one of Orderson's accounts, and that folklorist Andrew Lang identified the differing versions told by Orderson in a December 1907 article published in Folk-Lore Journal. After combing through existing documentation to determine the veracity of the Chase Vault stories, Lang reported that he could find nothing to substantiate them, either in the burial register of Christ Church or in contemporary newspapers on Barbados, aside from an "unpublished firsthand account" by a Nathan Lucas, who claimed to be present at the opening of the vault in April 1820." I live in the greater New Orleans area. We have the same problems as Barbados. Namely, constant rain. We can't bury underground because the bodies float. So the people here build above ground tombs. This wasn't always the case. In fact, in St Louis Cemetery #1 outside the French Quarter you can find a perfect example of that. It's where the tomb of the famous voodoo priestess Marie LeVeaux is located. One second of the cemetery has below ground graves. There are now great heavy rock slabs over top of the below ground graves. When it rains, the coffins float. You can hear the coffins hitting the underside of the stone slabs. I'm thinking it's the same in Barbados. Let's not throw this story away so quickly. Lets go at this piecemeal and analyze what we know. We have two huge constraints here. Time and poor record keeping. Or maybe now? One should not view poor recording as a means for something not being true. Let alone fabricated. I for one take people at their word until proven other wise - this case is no exception. Here goes. The 1st coffin to be deposited was 1807:Mrs Goddard. Hon. T. Chase. The three previous coffins where found to be displaced. The word at that time was "a confused state. ", tossed from their places. The vault was then re-opened to "receive the body of an infant" all four coffins made of lead where tossed and 'displaced" i.e. a "confused state"
In 1816 Mr. Brewsters body was placed in the vault - great disorder again was discovered. Its fair to mention the vault was reorganized at the adding of each new coffin. Never was the disorder ignored. In 1819 Mr. Clarke was placed in the vault - disorder again was discovered. Are you seeing the pattern here? Look how close these deaths are? From the pic above you can see the vault was narrow: The coffins where stacked in the manner of three on the ground, side by side and others laid on top of them. 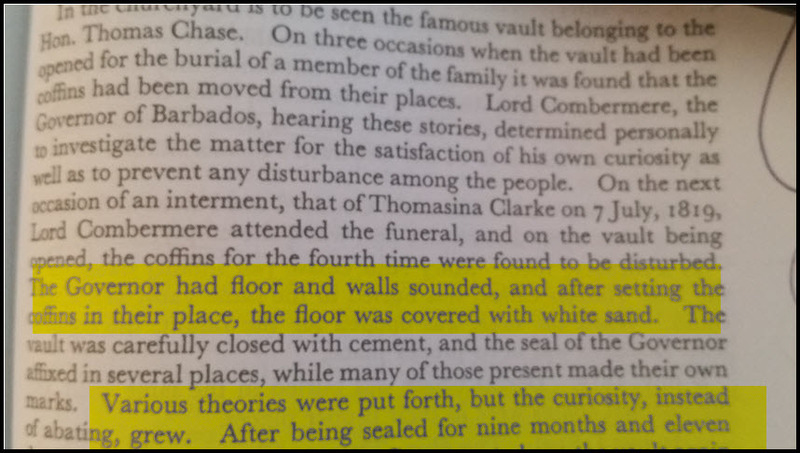 The last time the vault was open was 1819, by Lord Combermere - purposely attended to confirm what was happening, once again all coffins were displaced. This time some where facing, down and some where facing up. Documentation exists that confirm the funerals of all the names mentioned above. So thats a total of seven years. This mystery went on for seven years. Now i dont know Jerome Clark, I have no clue about the level and depth of his investigation but Mr Andrew Land who you mentioned had a brother-in-law who lived on the island at the time. His name Foster Alleyne. 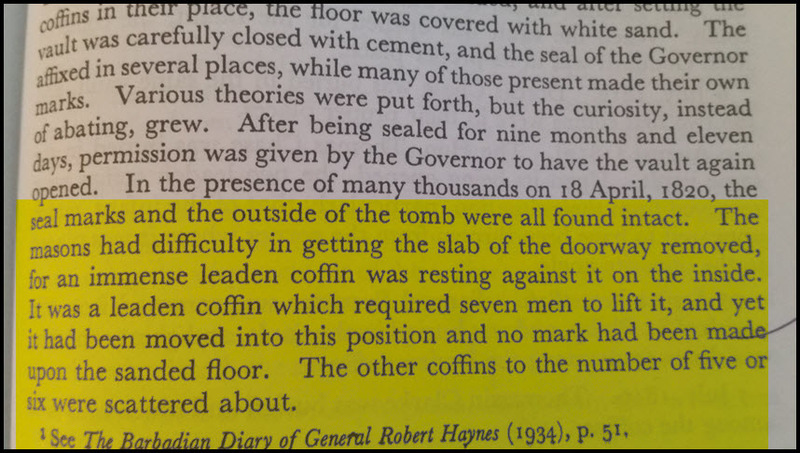 Mr Alleyne was able to get his hands on a report- signed report at that, confirming the tomb was last opened in 1820, not 1819. The report has the signage of the Governor, and Lord Combermere. Drafted by Hon. Nathan Lucas who was also present - all 3 men who witnessed the disturbed coffins. they wrote their findings down. Their report now sits at the Public Library of Barbados. It was from this report that the Church of England got its publication. The publications reads as follows. Special attention to the highlighted font areas. Lord Combermere attends the funeral as did the Governor. Both men ordered the vault sealed with cement, and on it where placed the Governors seal as where other markings to detect tampering. After nine months the vault was re-opened, sealed mind you, thousands of on-lookers in attendance. All the seal marks, tamper detection marks where still in place. One of the heavy coffins had been moved, was now laying on the door for which the masons where trying to move. This coffins and all the coffins therein - is documented as always requiring seven men or more to move. The other coffins, six in all where scattered about. As I stated above the documentation sits in the library , Barbados Dineson History - a publication. . But lets not stop there. More memoirs exists. - The Hon Thomas Chase was buried in the vault. When the vault was re-opened his coffin and those around him "had been thrown about.". The infants coffin was now sitting on the opposite of the room. He lists the accounts person by person, year by year in his diary. The repeated word being used is coffins appeared in a "confused state" that means they were moved in a manner that would seem impossible. Size of the vault in question? 12 feet by 6 1/2 feet. Had only one way in. The front door. The door what needs to be opened by more than six men. The question not being raised by everyone, esp skeptics is the manner of which each person died? The first disturbance began after Dorcas Chase was entered. Reports show she died due to self starvation. Suicide? The next displacement or Thomas Chase I should say mentions he died to at his own hand. There are notes in Barbadian Diary of Robert Haynes that talk about the deaths Dorcas Chase and her father Samuel. In the notes it lists him as a harsh parent and cruel slave-owner, strange happenings occurred. That sentence alone should remind you of a famous, cryptic, disturbing haunting in early Tennessee. The Bell Witch John Bell owned slaves and a belief among many for his torment was his ill-treatment of slaves, his daughter and his shooting at a strange animal. Now i believe these stories and let me tell you why. The involvement of the Governor, the Lords and so on imply something very serious is going on. This is the late 1700's, early 1800's. A tomb disturbed by vandals, by robbers, by pranksters, by anyone is a serious manner. Word travels fast. If people can't feel safe when there being laid to rest where can they feel safe? Your final resting place is just that, your final resting place. The island was once a slave colony for Britain. Which meant the minority ruled over the majority, even after slavery was abolished. Hoaxing and pranks are a 20th concept, not even close to being attributed to 1700 and 1800's. What the the Governor did was what any good researcher or investigator would have done - he sealed the room shut, He cemented it. How do you hoax that? All this was done in plain view - in full-view of a 1,000 people or more. They documented the event by keeping diary's and by markings the tomb from the outside with the Governors seal and etc. On-lookers even marked the tomb themselves when given the chance. This seemed to be a problem worth investigating for everyone. Like I said if you can't feel safe when at peace, when can you feel safe? There's room for immense skepticism had this been just a one off incident. But it wasn't. I hazard to say this but graves and cemeteries where more sacred and off limits back then than they are now. No one's going to bombard a sealed tomb, let alone skutter around 3 to 5 coffins, one with an infant in it. Seriously? To move one coffin (made out of lead) each required six men or more. No one's faking this for seven years. Each event garnered more attention. Each event garnered more scrutiny, so much it finally called for the involvement of the Governor. 2nd thing. People, important people kept diaries back then. Record keeping. Notes keeping. Memorandum if you will. That helps me believe this story is true as well. 3rd - Having lived with a Poltergeist or unknown spirit I can attest to saying the lifting of a heavy object and by heavy object I mean an object that requires three men or more to move is nothing for a Poltergeist. A Poltergeist can flip your Humvee and not break a sweat if it wanted. Depends how mad off you get it. I'm 6'5 1.2, I weigh 250lbs. It took me and two other men my size to move my dresser upstairs. My dresser weighs 350lbs. I've seen it fly through the air as if it as a nurf football. I've seen our couch levitate and go flying across the room. Moved as if it was cardboard. Whatever did this inside this vault was angry beyond belief. It had no respect for person. Not even a deceased child. I truly believe the closed space gave rise to some of the energy being pent up. I'm taking about the tomb itself. The self inflicted deaths if true, is interesting. That might explain why the phenomena is happening. And last but not least. One should not be too quick to dismiss something as being untrue based on the belief that there were not good records i.e. news reports. Those are relative words. A diary is a record? Something written down, for the sake of just being written down is a record. I dont have a hard time believing after the 5th disturbance or so the Governor had to get involved and by doing so gained the interests of 1,000 towns people. This Governor seemed to want to get to the bottom of this. I can't fault him or anyone for the investigative approach they took. That was a long time ago. Its now 2017 - we'll never know the whole truth, but one thing I'm sure on no hoaxing or made up story took place. I've seen heavy objects fly through the air as if they were paper airplanes. The people laid to rest have a dark secret only they know about and by dying probably conjured up some negative dark energy that due to their death decided to haunt their tombs for eternity. THIS CASE IS FASCINATING. I’m afraid that if you rely solely on Lord Combermere as a source, you must give up your belief, for there is no hard evidence that he really had anything to do with the famous coffins. The original connection between the story and the Governor comes from a book, Memoirs and Correspondence of Field-marshal Viscount Combermere, from his family papers, by Mary Viscountess Combermere and W.W. Knollys.Vol I. which was published after the Lord died. The text is available on line. The two authors discuss unpleasant politics in Barbados, while Lord C was Gov. there, then offer as a change of subject, the story of the Vault and coffins. The story of the moving coffins begins on page 385, and narrates the familiar story, roughly as we have been discussing it here. The story is told in third person--never an “I saw,” or “I did.” It ends on page 393 with a footnote that reads: “These details have been collected from a pamphlet printed for private circulation by an inhabitant of Barbados.” Clearly the persons who put together the book were not quoting anything from Lord Combermere, but a pamphlet (title not given) written by a person whose name is not given, nor is there any date for the pamphlet. Edited by Lamfada, 28 June 2017 - 10:36 AM. I think everyone concerned has had their say now... maybe it's time to just let the members mull it over and decide for themselves.